March 19, 2017—-President Obama joined an elite group of people that led to the establishment of our national parks and monuments. Two of those men were John Muir and President Theodore Roosevelt. Theodore Roosevelt signed the Antiquities Act in 1906 under which many of our national parks and monuments were established. The Antiquities Act gives the president the authority to set aside sites that are historically or scientifically important. Since Roosevelt signed the act more than a thousand different marine protected areas have been created. President Obama used this act to further our federal park system 29 times during his eight years in office. Some of the area is on land and some is in the global ocean. President Obama set aside more ocean environments, as monuments and reserves, than any other person in history. Altogether he added more than 850 thousand square miles (1.3+ million km2) of ocean for new reserves and additions to existing one. Under American law oceans existing within 200 nautical miles of land can be included in protected reserves. On September 5, 2016 President Obama established the Northeast Canyons and Seamounts Marine National Monument. It is the first national marine monument off the east coast of the United States. It covers approximately 4,913 square miles (12,725 sq km) and includes two separate sections that are near each other. 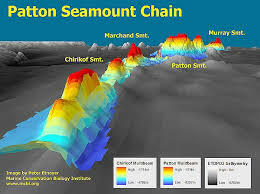 One includes three canyons cut into the continental shelf, and the other includes four extinct volcanoes or seamounts that exist on the deep sea floor off the shelf. 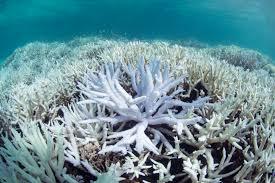 Coral bleaching is happening along many reefs today. Along much of the Atlantic coast of the United States there exists an underwater shelf that extends out to sea for a great distance. Scattered along the edge of this shelf are deep canyons cut into the edge. The canyons drop thousands of feet. The exact origin of these canyons is unclear. One section of the monument includes three of these canyons. The larger section of the monument includes four seamounts. A feature of this section is that approximately 50 species of deep sea coral reside nearby. Some at depths of more than 12,800 feet (3900 meters). Commercial fishing and the taking of any physical or organic material from the site is prohibited. Some crab and lobster harvesting will be allowed for several years but then terminated. President Obama set aside marine monuments. Papahänaumokuäkea Marine National Monument includes the Hawaiian Islands and extends to the northwest to include Midway and other islands. This monument was first created by George W. Bush. In 2016 Obama quadrupled the size of the reserve. It now includes nearly 600,000 square miles (966,000km2) of ocean islands making it the largest marine reserve in the world. It is also the largest single area protected by the United States and is a United Nation Heritage Site. It contains thousands of marine species, half of them unique to the Hawaiian Islands. One of the significant aspects of the marine monuments and preserves that Obama set aside is that they are north of the tropic of Cancer. 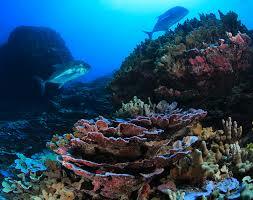 Most coral reefs are in the tropical oceans. These reefs are being destroyed by bleaching due to warming water. The most severe damage to coral reefs is between the equator and 30 degrees either side of the equator. More than 30 countries in this region have reported bleaching to offshore reefs. 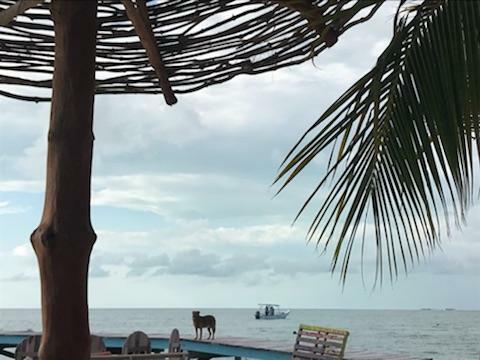 The establishment of the reserves and monuments in higher latitudes not only stops damage by fishing and collecting but promises to provide time to study the reef life before the seas have a chance to warm enough to destroy them. Thanks President Obama! Categories: Climate Change, Coral Reef Bleaching, Fossil Fuels, Pollution, Renewable Resources | Tags: #climatechange, #coralreefs, #nationalparks, #renewableenergy, #seamounts | Permalink. 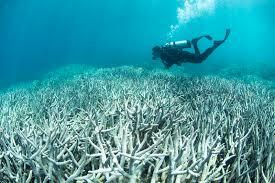 Oceans warm and the Coral Reefs die. June 10, 2016—Coral reefs are one of the richest ecosystems on the planet. They differ from land ecosystems in that the major populations making up the system are animals rather than plants. Land ecosystems include forests, grasslands and deserts. Coral reefs essentially consist of animals. The huge variety of animals includes those with backbones and those without. The most prevalent animals are those without backbones such as sponges, snails, clams, scallops and squid. Better known animals are starfish and sea urchins. The primary food for the animals is algae. The algae supply the animals with sugars and oxygen in return for shelter and carbon dioxide. These microscopic algae produce the basic color for the reefs. Coral reefs are dying at an unprecedented rate. 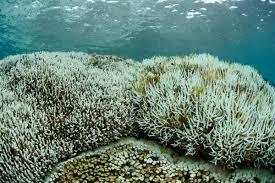 The dying of the reefs is attributed to a process known as bleaching. 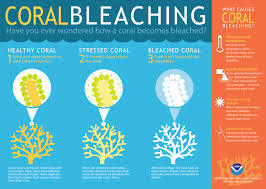 The bleaching is actually the result of the death of the microscopic algae that both color and feed the coral. When sea water gets too warm for prolonged periods of time, corals become stressed, causing them to expel the algae. This expelling of the micro-organisms leaves the coral appearing bleached or whitened. Coral can survive for a period of weeks without the algae but, in longer periods of time, the algae begins to die. A number of factors can cause the algae to die but only warmer than average water temperature can cause widespread loss. It can occur with sea temperatures being as little as 1°C (2°F) above normal monthly temperatures. 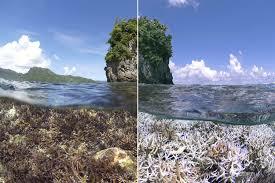 Climate Change causes warming of the oceans leading to dead coral reefs. Ocean temperatures are rising due to global warming. Other events such as El Ninos can further warm the water. It often takes only a small increase in water temperature to start bleaching. Records show the water temperature in 2005 was the warmest in the last century. In the fall of 2005 there was massive bleaching in the Gulf of Mexico and Caribbean. At Culebra Island, Puerto Rico, up to 97 % of the coral colonies surveyed bleached when water temperatures rose to 32°C (89°F). Since it is this algae that gives the coral its basic color when the algae dies the coral begins to whiten. 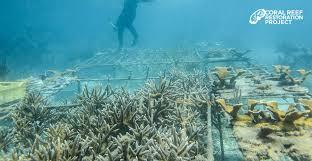 It takes only a week or so of bleaching to kill coral. One of the Caribbean islands which has suffered major losses to coral reefs is St John, one of the the U.S. Virgin Islands. There have been two major bleaching events so far in the 21st Century. The first was in 2005. This event was the worst on record to date. Bleaching was first noticed in July of 2005 and it continued into 2006 as disease also took a toll. Most coral around the island showed some bleaching and more than half of the reefs died. The most recent event was in 2010 when average sea water temperature was unusually warm from August through October. 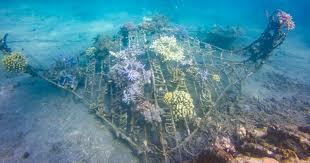 An example of a dead coral reef. During a visit to St. John a couple of months ago I was able to see the damage first hand. Snorkeling over a reef at Salt Pond Bay where there was essentially no living coral visible. There were occasional living organisms visible but for the most part it was simply without life. Nearby was Trunk Bay which faced the open ocean and the rocky beach was covered by bits of broken bleached coral. An interesting feature on this beach was that visitors have used the broken bits of coral to create images of all kinds. These reefs have the ability to regrow if water temperatures would remain below 89 degrees F. However, since average ocean temperatures are rising it seems most likely that there will be more losses in the future. The Great Barrier Reef lies off the coast of Australia. It is the earth’s largest system of coral reefs and, in 1981, was listed as a World Heritage Site. It is one of the largest heritage sites covering an area of more than 336,000 square kilometers (130,000 Square miles). 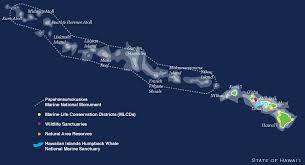 It consists of nearly 3,000 individual reefs of varying sizes and almost 1,000 islands, also of varying sizes. At the time of this writing, a greatly expanded area of coral bleaching has been detected off the east coast of Australia. Almost all of the reefs, from the city of Cairns northward, show evidence of bleaching. Since Australia is in the southern hemisphere water temperatures are the warmest on the north end of the reef, but decrease southward. In all, nearly half of the reef is suffering bleaching. 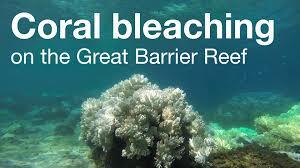 In the northern, where the water is the warmest, bleaching is affecting nearly 93% of the great barrier reef. 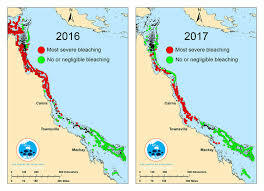 Southward to the region offshore from Cairns, the bleaching is affecting an average of 25 t0 50 percent of the reef. In recent months water temperatures have been warmer than usual and the area of bleaching is expanding southward. Reefs around the world are being affected by bleaching. More than 30 nations have reported losses to offshore reefs. The United Nations Environment Program indicates that a third of the world’s coral is dead or dying. They also predict that 60% of all reefs will be lost by 2030. Another increase of 1°C (33.8° F) in global temperatures will increase bleaching substantially. Coral bleaching in the tropical oceans by 2030 may alter the entire global ocean ecology. Large numbers of species of fish and other organisms will simply cease to exist. This year NASA is beginning a new program to monitor the extent of coral reefs in the Pacific Ocean. 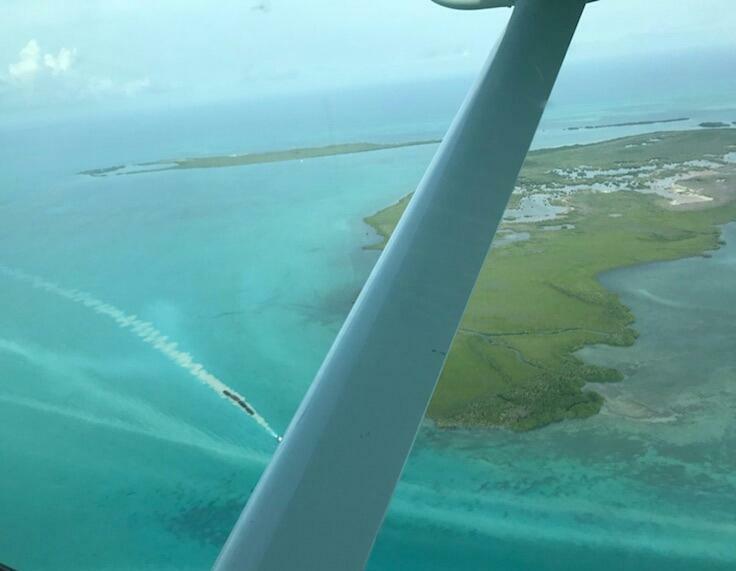 The program is the Coral Reef Airborne Laboratory. It will combine satellite data with surface data for a year and focus on entire reef systems. The demise of the coral reefs is becoming part of the sixth mass extinction the planet is experiencing. The evidence of global warming and its effects keep piling up! It is past time for determined action! Categories: Climate Change, Coral Reef Bleaching, Islands and Climate Change | Tags: Climate change, Coral Reefs, Coral Reefs and Climate Change | Permalink.